Elegance Chapel is a charming satin edge veil. If you’re wanting a fuller veil with a satin edge, this is a lovely choice for you! This very elegant three tier veil has a 6mm satin edge. It can be worn high on the head for a fuller look, or towards the back of the head, if desired. The top two tiers are 80cm and 100cm long. The chapel length tier is 210cm long, and is available in longer lengths. Made in extra fullness. 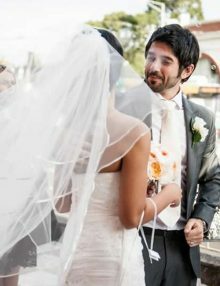 Special feature: This veil has detachable layers, which enables you to remove the long layer, and wear it as a shorter two tier veil at the reception. 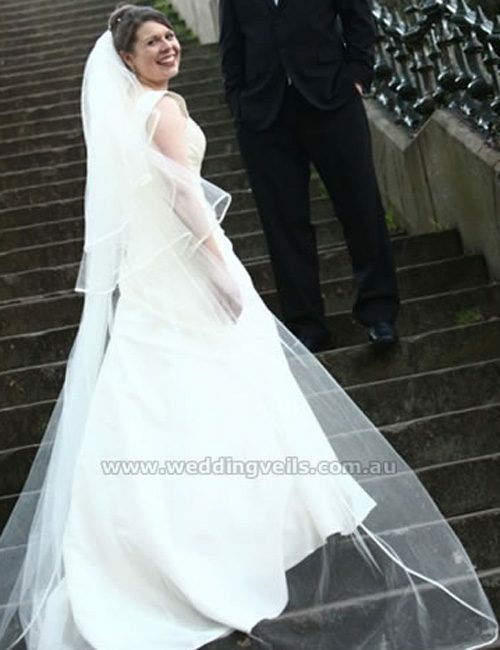 This veil is worn by Crystal M, as shown on the Our Brides page. Please note: This veil is made to order. Production time frame is around 3-4 weeks.